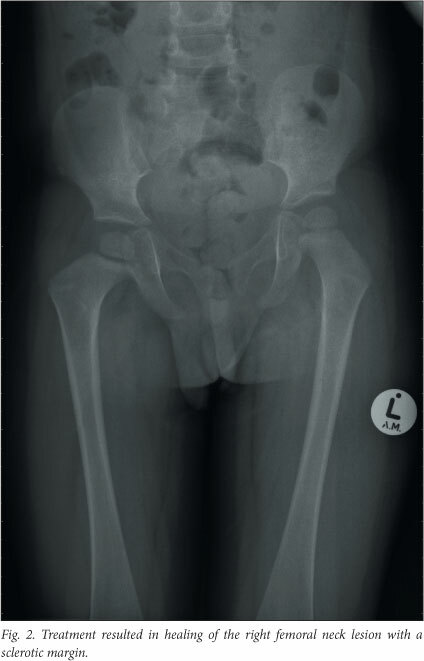 An 18-month-old boy was referred to an orthopaedic surgeon with a 2-week history of a limping gait, and a left mid-shaft tibial bone tumour as seen on magnetic resonance imaging (MRI). Tumour resection and a bone transplant were done. Histological examination confirmed the diagnosis of Langerhans cell histiocytosis (LCH). The resection was deemed to be complete, and a follow-up skeletal isotope scan was scheduled for 3 months later. At this follow-up visit the patient was clinically well, but the skeletal isotope scan revealed areas of abnormally increased uptake in the anterior aspects of the 7th and 8th ribs on the right side. A computed tomography (CT) scan confirmed the presence of a bone-destroying tumour affecting these ribs. A rib resection was performed and once again histological examination confirmed LCH. The boy was referred to a paediatric oncologist for further management. At the paediatric oncology unit a work-up was done to determine the extent of disease. Staging investigations included a complete blood count with differential counts, renal and liver function tests, measurement of ferritin and C-reactive protein, an endocrine profile, bone marrow examination, abdominal ultrasound, a chest radiograph and a skeletal survey. The staging investigations excluded any organ dysfunction. The skeletal survey showed lytic lesions in the left parasagittal area of the skull and the right femoral neck (refer to Fig. 1). 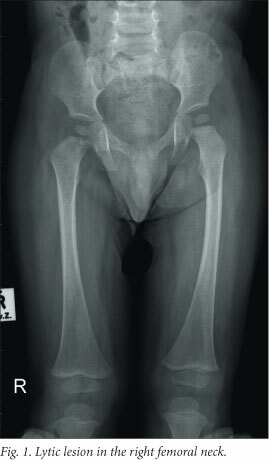 A final diagnosis of LCH with multifocal skeletal involvement only was made. Chemotherapy was commenced as per the protocol for multifocal bone disease. The initial intensive phase of chemotherapy consisted of daily prednisone and weekly vinblastine for a total of 6 weeks. Reevaluation imaging (skeletal survey, skeletal isotopes and CT of the facial bones) after the initial intensive phase showed that the patient still had active disease in some of the initially affected areas. A second initiation phase was therefore commenced. Imaging 6 weeks later confirmed that the patient now had non-active disease (i.e. regression of signs and symptoms and no new lesions). He therefore proceeded to the continuation phase of treatment, consisting of oral prednisone pulses and vinblastine every 3 weeks for a total of 52 weeks. Imaging repeated just before the end of the continuation phase showed that all of the initial lesions had disappeared, but a new lesion was present on the medial aspect of the left ilium. The state of the disease was now defined as progressive or refractory. Since the new bony lesion was inaccessible, excluding curettage with intra-lesional steroids as an acceptable treatment option, second-line chemotherapy was commenced. The second-line treatment consisted of fortnightly methotrexate infusions, weekly vinblastine and daily oral prednisone, for a total of 6 weeks. At this stage the disease was in a regressive state and the patient proceeded to the second-line continuation chemotherapy consisting of 4 drugs (oral prednisone pulses, vinblastine every 3 weeks, weekly oral methotrexate and daily mercaptopurine). He successfully completed the 52 weeks of the continuation phase, and recent imaging confirmed that he still has non-active disease. The only remaining signs are a slight coxa vara deformity secondary to the right femoral neck scar (Fig. 2) and a localised depression in the lower ribcage at the site of the rib resection. LCH is primarily a paediatric disease: it may affect any age group, but the peak incidence is at 1 - 4 years of age. It is a rare disease with an incidence of 3 - 5 per million children aged 1 - 14 years. [3-5,7,8] Cases are essentially sporadic. The spectrum of presentation is broad and protean, ranging from a benign course to a fulminant progressive disease. [4,5,7] Almost any organ can be affected. According to the number of organs involved, it is possible to distinguish between single-system and multi-system disease. [3,7] The majority of patients have single-system disease, most cases involving skin or bone. Multi-system disease consists of various combinations of multiple organ involvement, and there may also be organ dysfunction and pronounced generalised symptoms. Features of LCH that indicate a poor prognosis include age of less than 2 years at diagnosis, any risk organ involvement (bone marrow, blood, liver and spleen), organ dysfunction, multi-system disease and unsatisfactory response to initial treatment. [2,10] Children with poor prognostic features constitute less than 15% of patients with LCH. Patients without involvement of risk organs (low-risk group) are not at risk of death, but still need systemic therapy in order to control the disease activity and avoid reactivations and permanent consequences. Irreversible long-term deficits that develop in areas of active LCH include small stature, growth hormone deficiency, hypothyroidism, hearing loss, cerebellar ataxia, orthopaedic deficits, biliary cirrhosis and portal hypertension. Diabetes insipidus is the most frequent CNS-related permanent consequence in LCH, usually requiring lifelong replacement therapy. There is also an increased incidence of malignancy in long-term survivors. Even though most LCH lesions eventually resolve spontaneously, the goal of therapy must be to rapidly achieve and maintain a non-active disease state in order to avoid the acute morbidity as well as the destructive sequelae that result from disease activity. Because of its extreme clinical heterogeneity, LCH can present to a variety of specialists (e.g. general paediatricians, dentists, dermatologists and orthopaedic surgeons), and a high index of suspicion is necessary to make a timely diagnosis. 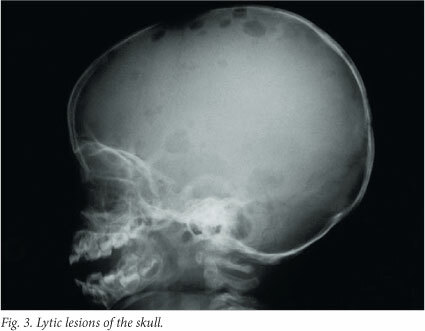 The clinical hallmark of LCH is lytic bone lesions. LCH should also be considered in the case of idiopathic diabetes insipidus, or atypical or extensive skin lesions in infants or young children. An accurate histological diagnosis is needed. Any child with a suspected solitary LCH lesion must have a full diagnostic work-up to exclude multiple lesions. All patients with LCH must be referred to a paediatric oncologist for proper risk stratification, an appropriate treatment plan and long-term follow-up. Systemic therapy is indicated to prevent irreversible damage to normal tissue and long-term consequences.